The Labour Party has ramped up preparations for European parliamentary elections this year by agreeing a process for selecting its MEP candidates, LabourList can reveal. Officers of the national executive committee (NEC), the party’s ruling body, this week signed off on a provisional timetable that would see applications open today in regions where there are vacancies. The deadline for all applications has been set as Wednesday 10th April, giving anyone wanting to stand for election as a Labour candidate less than a week from now. On 11th and 12th April, joint panels – made up of NEC members and regional executive members – will shortlist candidates, then on 15th and 16th April the following week, the panels will interview candidates (“by phone where possible”). 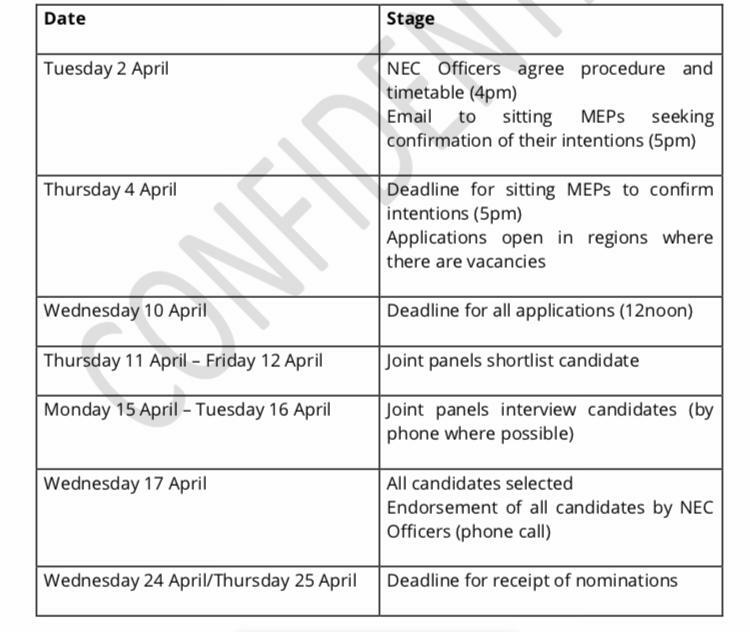 Labour intends to select all its MEP candidates by 17th April and have them endorsed by NEC officers on that same day. The document sent to all NEC members reads: “The EU have expressed a willingness to hold a summit on or around the 11th April to decide whether or not to allow an extension to Article 50, however, the UK government would have to indicate before then, that we will participate in the European parliamentary elections. One NEC source told LabourList that the timetable was “very, very provisional” and ready to be “thrown out the window” if a long Article 50 extension – delaying Brexit such that the UK has to hold European elections – does not go ahead. Theresa May is set to ask the EU for a further extension beyond 12th April – but only of a short length. This would give the UK the chance to pass a Brexit deal before 22nd May and avoid participating in European elections. However, there is a possibility that the EU will refuse to grant another short extension and instead force the UK to choose between no deal and a lengthy extension.